I eat a lot of chickpeas. I also eat a lot of chickpea flour. It is naturally gluten-free, being made from chickpeas, and it is pretty versatile. Plus, it is cheap, which always wins with me. I actually made this awhile ago and am just getting around to posting about it now. 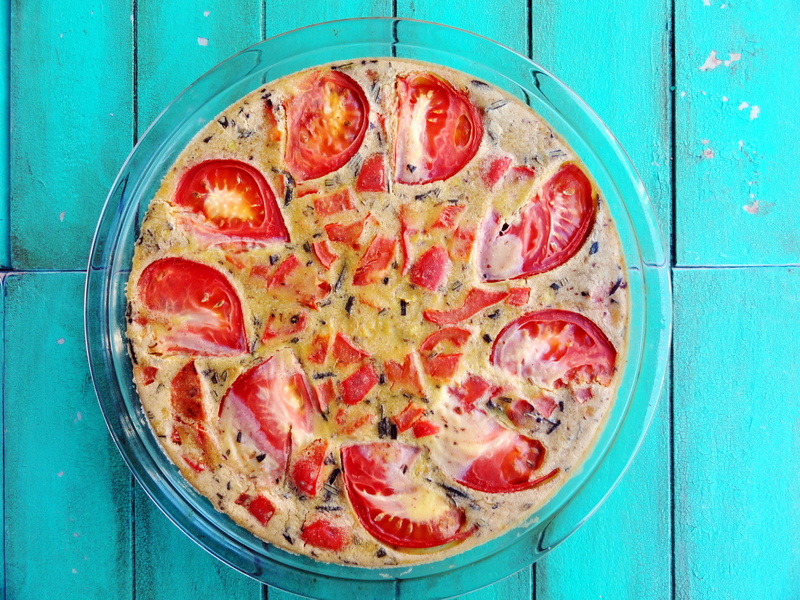 This frittata is made primarily of chickpea flour, with a few seasonings, and you can add whatever veggies you happen to have on hand. Before I get to the chickpea frittata recipe, I also have some exciting news! The newest issue of T.O.F.U. magazine recently came out, and I have two articles in this issue. One article is all about canning your own fruits and vegetables. The other is a recipe for gluten-free and vegan nanaimo bars. I am obviously biased, but to me, these taste amazing and very much like the sickeningly sweet bar I grew up with. You can download the newest issue here. Enjoy! Now on to the Frittata. Preheat oven to 350 degrees. Mix the chickpea flour, water, pepper, salt, oil, rosemary and nutritional yeast together. I like to use a whisk to make sure it is well combined. Let it sit while you heat up a frying pan. Slightly cook your vegetables and garlic until softened. Mix the vegetables into the chickpea mixture. Pour the mixture into a greased pie plate. Optional: slice a tomato and place on top. Bake in middle of oven for about 30 minutes, until set in middle. 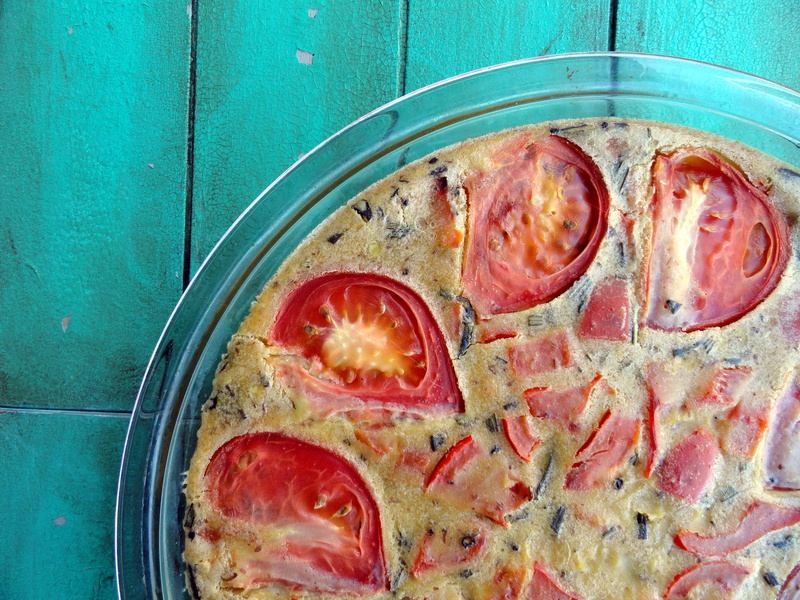 You could really bake this less or more, depending on how firm you prefer the frittata. I wouldn’t go less than 20 minutes so that you cook out the raw taste of the chickpea flour. I used a shallow 9 inch glass pie plate, and had a bit left over, so I just poured the rest into a ramekin. Let cool for a few minutes and then slice! The weather has been amazing this weekend, and I can’t wait for summer! 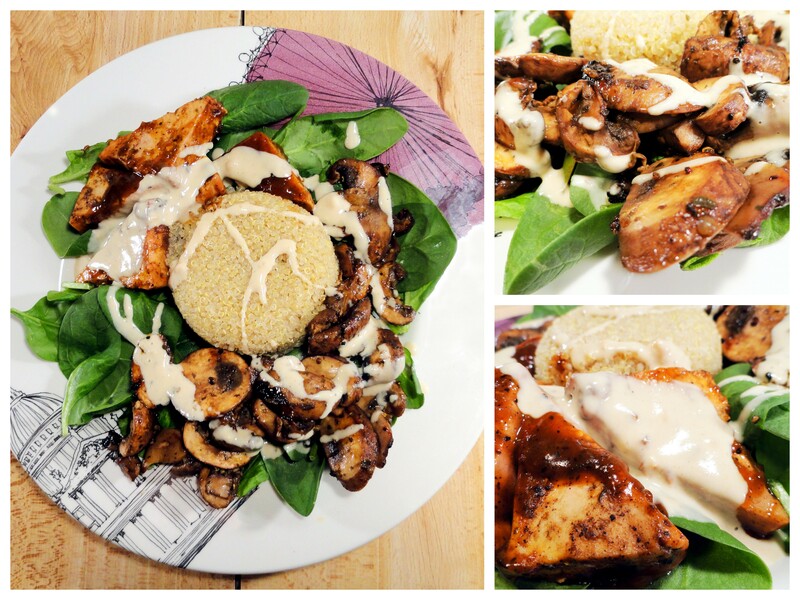 My food preferences tend to change from less heavy, hot meals, to lighter, “fresher,” meals. I had a craving for tatziki sauce, so I decided to make my own. It is pretty easy to make it yourself, and the results are worth it. It is great with veggies and rice, dolmades, as a salad dressing, or even falafel. Peel and seed the cucumber. Roughly chop it until you have a cup. Put in a colander and salt with a couple of generous pinches of salt. Let it drain for about 20 minutes (This takes out the extra moisture in the cucumber, so the resulting dip is thicker). Once the cucumber is ready, combine in a food processor with the rest of the ingredients and process until desired consistency. For some reason, my yogurt was super thick in the container, so my dip came out incredibly thick and I had to thin it out with a bit of water. If you are using a regular non-dairy yogurt but you want a very thick dip, you could experiment with draining the yogurt in a fine colander lined with a couple of layers of cheesecloth over a bowl until it thickens. I served my dip with a feta that I made out of extra firm tofu, crumbled and marinated in olive oil, lemon juice, lots of salt, pepper and Italian seasoning. I also made a salad with the feta, onions, tomatoes, cucumbers, lettuce and parsley. I bought some black olives to put in the salad but completely forgot about them until now. I also grilled some eggplant, red peppers and onions. 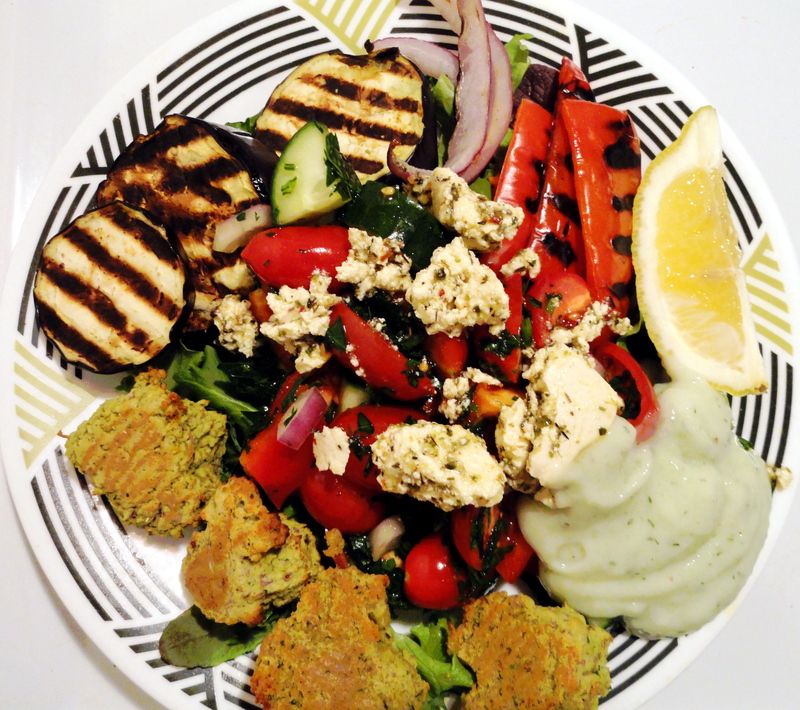 I made some of my baked falafel as well. 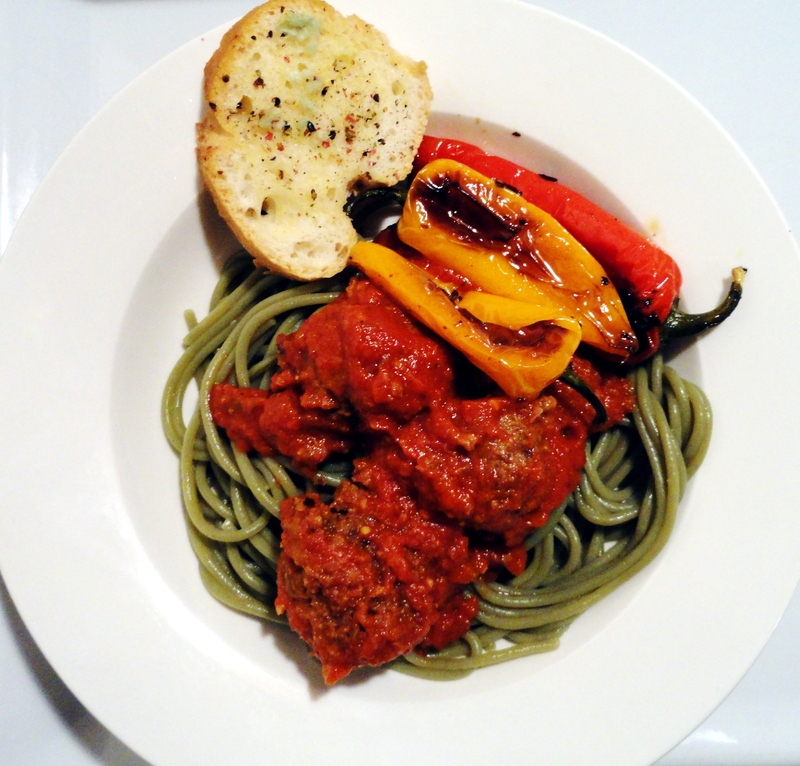 The other day, I used my leftover beanballs with some spinach and brown rice pasta, tomato sauce and garlic bread. I am really looking forward to the spring and summer, and the accompanying fresh fruits and vegetables that come with it! Dinner tonight was a delicious beanball sub. The bean balls were made from random things in my fridge and pantry: walnuts, chickpeas, brown rice, green onions, garlic, chickpea flour, oregano, basil, chia seeds and hot sauce. I blended everything together in my food processor and rolled them into balls, which I brushed with olive oil and baked in the oven at 350. The cheese was a can of coconut milk, simmered on the stove with some vinegar, lemon juice, nutritional yeast, hot sauce, salt and agar agar. I then cooled it in a container until it was set. The bread was a piece of Aidan’s baguette. 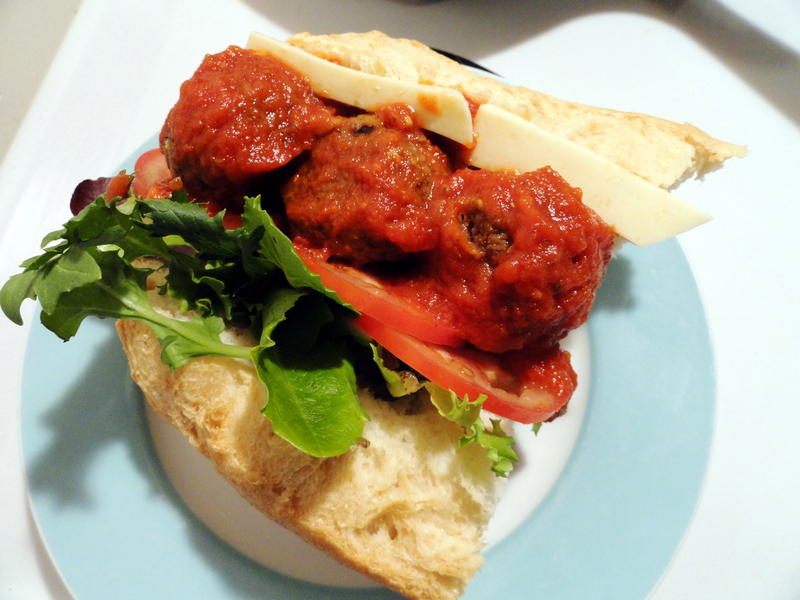 And thus concludes my annual veggie meatball sub craving! 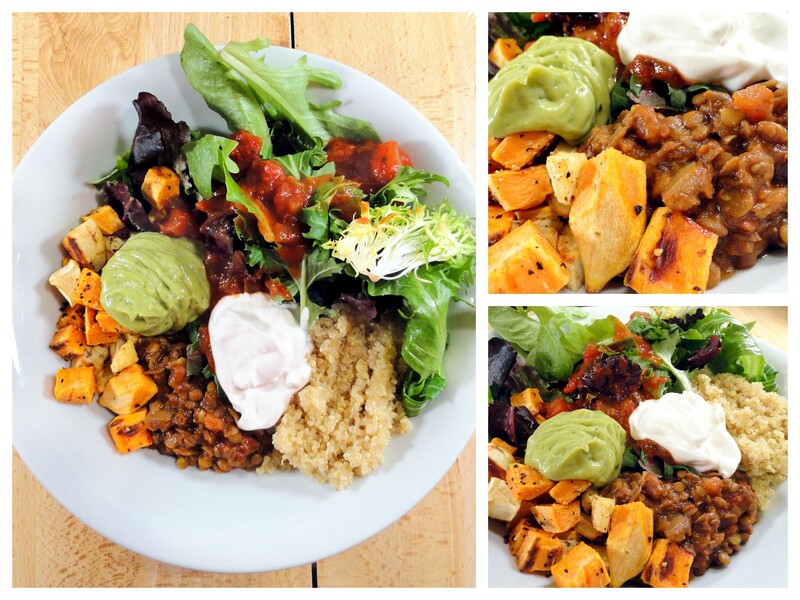 Dinner tonight was a bowl consisting of quinoa, roasted sweet potatoes and parsnips, lettuce, guacamole, Tofutti sour cream and lentil taco filling. Have you tried lentil tacos before? I love making lentils this way. 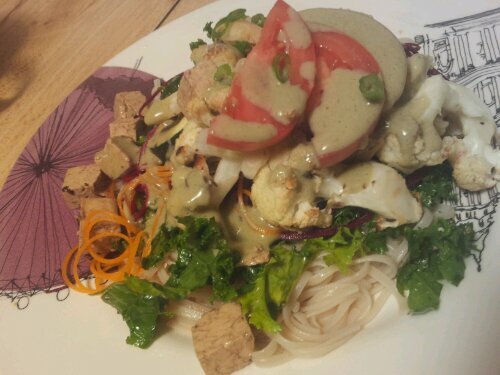 It is healthy, cheap and tastes great, so it is my kind of thing. I’ve been making bowls, but these would be good in a wrap or taco shell, too! I’m home after a long weekend of food and fun, and thought I’d share what I made. First up, an apple tart with a sour cream filling. I saw something similar on the Food Network, and thought “I could make a vegan and gf version of that!”. It was really easy and doesn’t have much sugar. I think it would look a lot better in a fancy tart pan, but I’m not always a fancy person. It also means that if you bring them to someone’s house, you don’t have to worry about getting the pan back when you’re done. Preheat oven to 350 degrees Celsius. Cover dates with boiling water, and let soften, about 10 minutes. Drain the water and puree the dates. I used a food process because that was all that I have, but a hand immersion blender may also work. In a food processor, combine dates, almonds, sorghum flour, nutmeg, cinnamon and brown sugar. Process until blended. You should have a crumbly, slightly dry crust. Press into a greased pan (I used a pie plate) and bake for 20 minutes. Let cool for a few minutes while you assemble the filling. For the filling, mix the sour cream, brown sugar and vanilla in a bowl and set aside. Peel, core and then slice the apple into thin slices. As you slice, place in a bowl of water and lemon juice to preserve the apple’s colour. To assemble, spread the sour cream filling over the crust and then top with the apple slices. Bake for about 30 minutes at 350. Once it comes out, drizzle with a little bit of agave. Let cool and serve! I also made a pumpkin pie with a Patsy Pie crust and the filling recipe from Welcoming Kitchen . It was really good! I topped it with Healthy Top, a delicious whipped cream style topping. The package made a giant bowl, but it kept for several days in the fridge. I also made Dreena Burton’s Festive Chickpea Tart from Let Them Eat Vegan! . I actually made this twice over the weekend for two different dinners. I also made the rosemary gravy from this book as well, but I didn’t get any pictures of it. It was delicious, though. Well, that just about sums up my weekend. Now I’m going to spend the week eating as many Honeycrisp apples as I can from the giant bag of them I bought at the market. Bob’s Red Mill gluten-free pizza dough mix, Daiya cheese and assorted veggies. Excuse the bad photo. I was tired and it was dark.